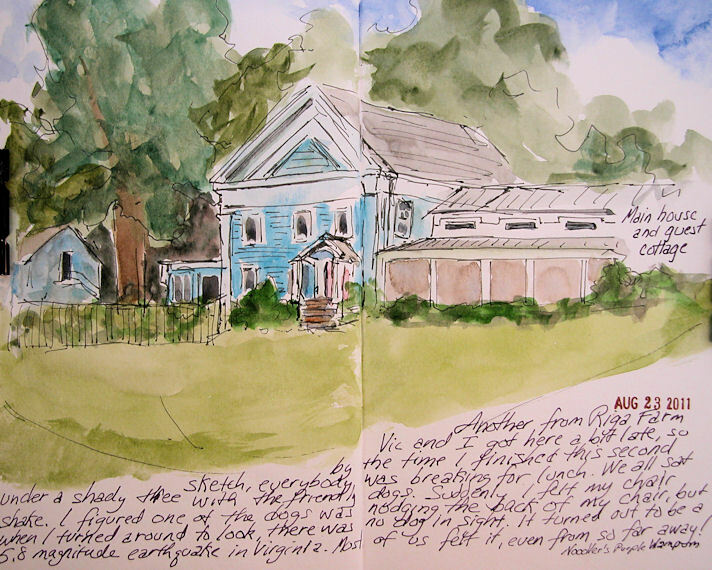 Main House at Riga Farm and an Earthquake! Vic and I got here a bit late, so by the time I finished this second sketch, everybody was breaking for lunch. We all sat under a shady tree with our friend's dogs. Suddenly, I felt my chair shake. I figured one of the dogs was nudging the back of my chair, but when I turned around to look, there was no dog in sight. It turned out to be a 5.8 magnitude earthquake in Virginia. Most of us felt it, even from so far away! 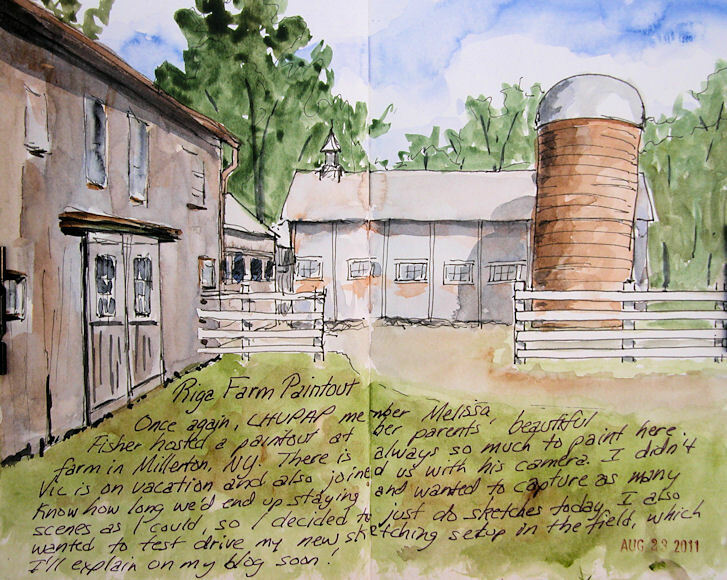 Sketch done with Winsor Newton and Holbein watercolors, and a Lamy Safari "F" nib fountain pen with Noodler's Lexington Gray ink. Writing was done with Noodler's Purple Wampum in a Platinum Preppy 0.5. This sketch is pen and ink with watercolors. The ink in the sketch is Noodler's Lexington Gray in a Lamy Safari "F" fountain pen. The ink used for the writing is Noodler's Purple Wampum (a fabulous muted, very dark violet) in a Platinum Preppy 0.5 fountain pen. 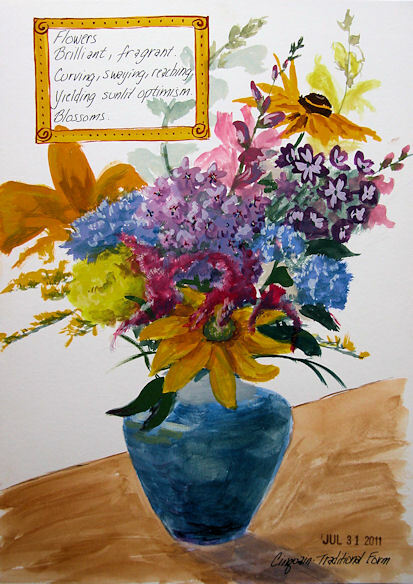 Watercolors were Winsor Newton and Holbein. Have I Found My Ultimate Sketching Setup? I've been test driving this new setup for a couple of days now, and it has solved many of my "too many things to hold" problems! Finally I can use my great Escoda travel brushes again, instead of just a waterbrush! 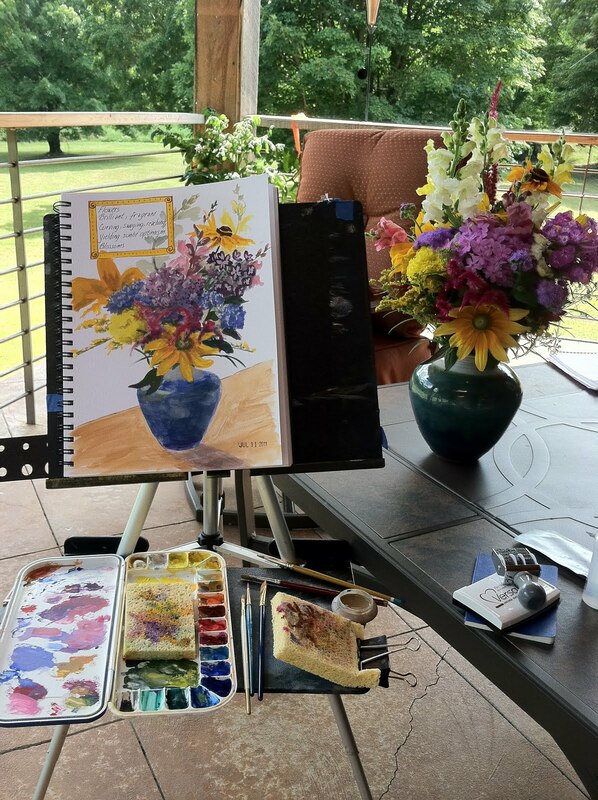 It was impossible to hold the sketchbook, palette, water cup, sponge, and brush, all at the same time, but those difficult days are over. 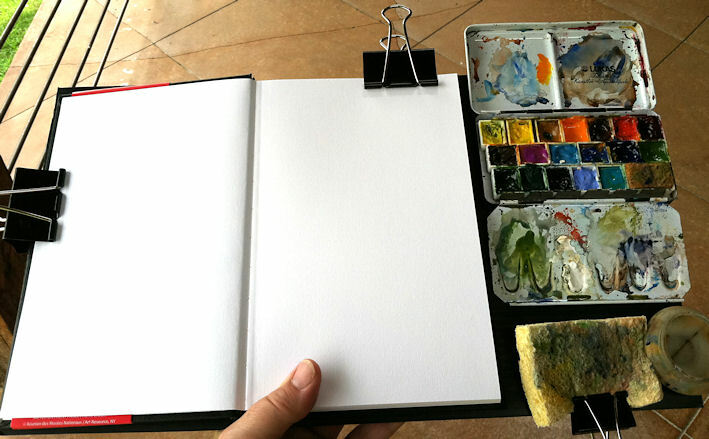 This very lightweight setup holds the book open for me as well as enabling me to hold everything on my lap or supported with one hand, leaving the other hand free for my brush. Using Industrial Strength Velcro cut to size, fasten the palette to that spot on the Coroplast. I fastened mine both on the lid and on the bottom of the palette. Clip an oil painter's plastic palette cup onto the free bottom corner of the Coroplast. If you like separating clean and dirty water, you can use the double cups. If you have room left over, clip on a piece of sponge to wipe your brush. That's it! The photo below shows the setup with a 5 1/2 x 8 1/2" Stillman & Birn sketchbook, which allows for a little more room to hold the other things than the 6x9" books. 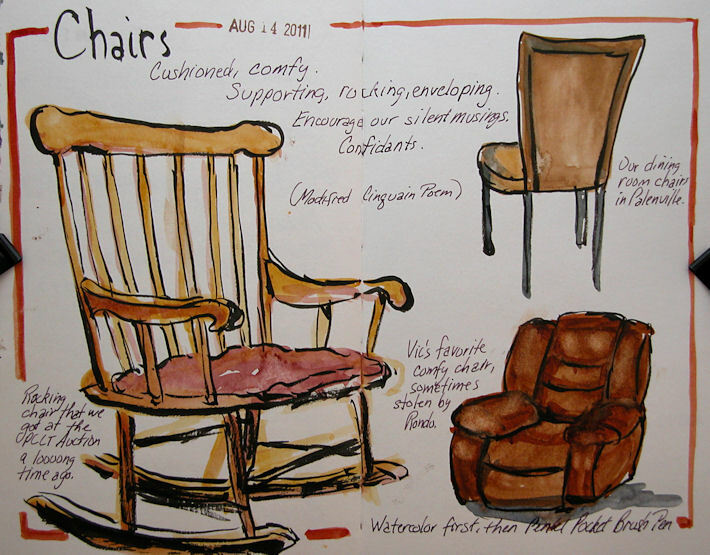 Of course, this idea can be adapted and the size reconfigured for whatever your preferred sketchbook may be. 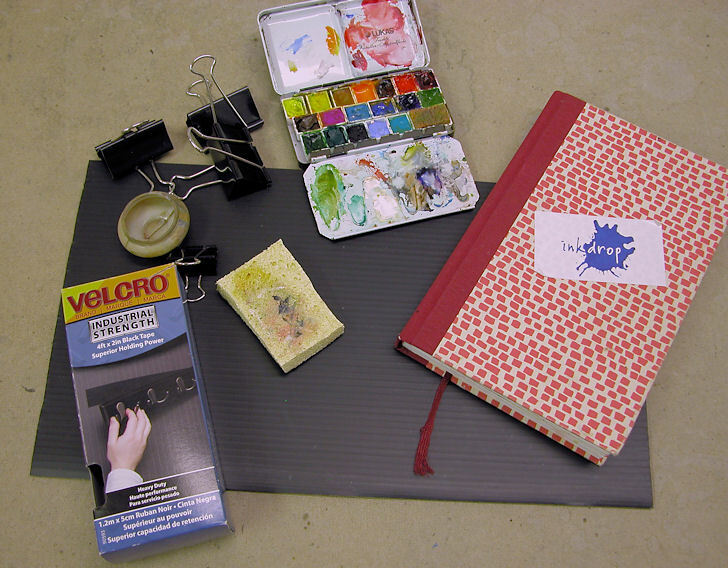 It is also equally effective for gouache as it is for watercolor. Vic stopped to make a phone call, so I did this two minute sketch while waiting. (upper left) The campsites all have these nice stone fireplace-grills, and some have beautiful views of the lake. We've heard there are a lot of bear issues this year, and that they're even climbing into cars at the campsites if visitors leave their car windows open. Everybody is being told to keep all food in a closed cooler inside their locked vehicles! Karen brought me these beautiful dahlias from her garden when she and her husband came over for dinner last night. She said she knew it was going to rain and I'd be looking for something to paint indoors. She was right, and these are the perfect subject for a gloomy day! 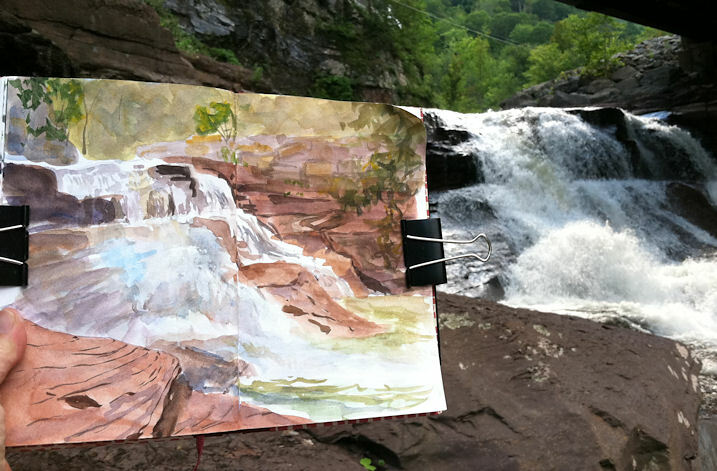 When you drive on Route 23a as it starts to wind through Kaaterskill Clove, you never suspect that hidden underneath the second bridge is this beautiful waterfall. You can see a tiny bit of the bridge structure at the top right of the photo above. 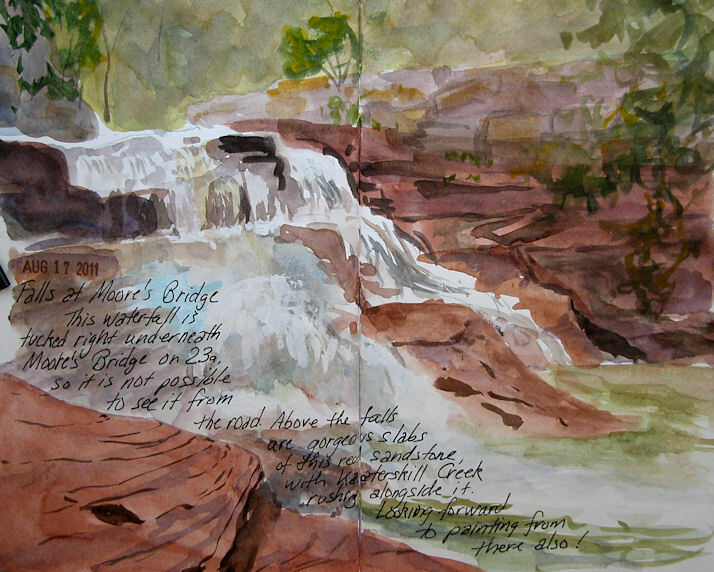 Kaaterskill Creek runs along colorful red sandstone ledges here, churning and spraying as it tumbles down the rocks and forms transparent pools at the bottom. My husband and I went exploring along Kaaterskill Creek. I brought watercolors and my Fabriano Venezia sketchbook. 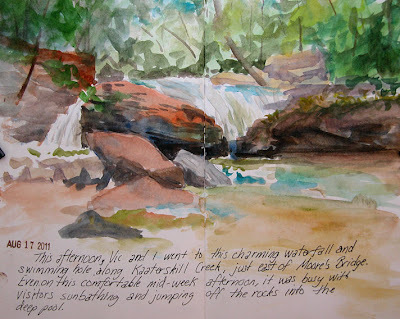 We came upon a very popular swimming spot along the creek with some small waterfalls and striking rock formations. It was a great place to spend a little time. I found an ideal place to sit on a rock and take in the scene. In case you thought I fell off the face of the earth due to my lack of painting and sketching posts, fear not! 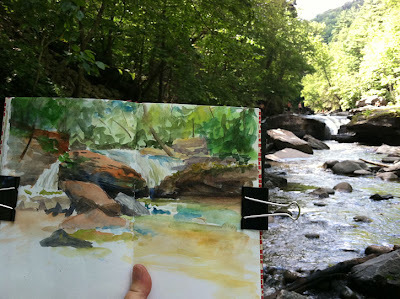 My husband is on vacation for the month of August, and we've been having a great time visiting all sorts of places that I plan to go back to with paints! Some things I'm just behind on photographing and posting, due to being busy having so much fun.....Like this one! You can click this sketch for a larger, clearer view. 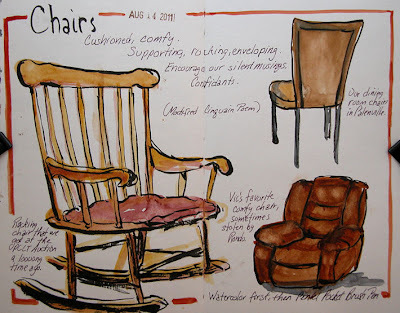 These are a few favorite chairs sketched from life one evening at home. I did something a little different for me this time; I painted directly with watercolor (no line work), then went back and drew with a Pentel Pocket Brush Pen. I did this for two reasons. First of all, I didn't want the ink to run when I did the watercolor work, and the ink in this pen is not waterproof. Secondly, I didn't want to "paint inside the lines", so doing the line work after I thought would allow for a looser and more interesting look. I'm not quite sure how it worked out, but I think I'll be experimenting more with this approach. 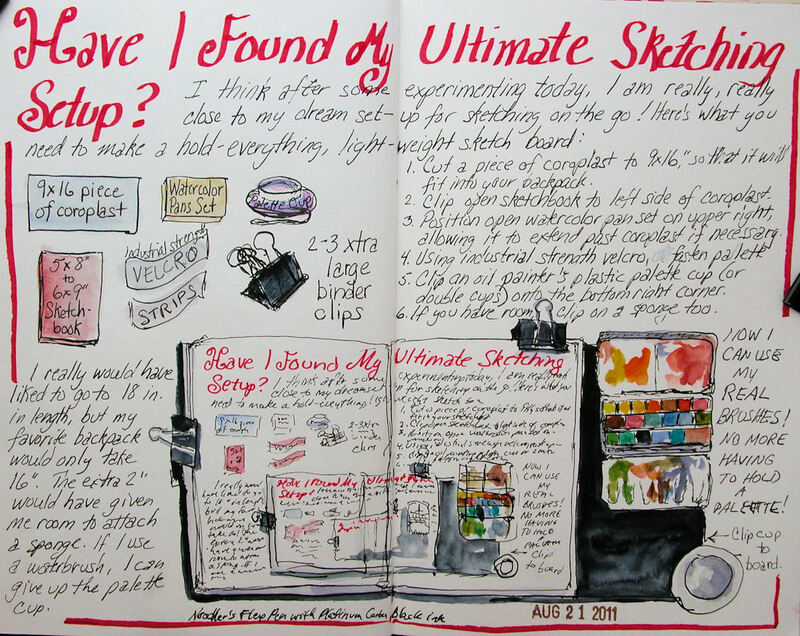 Initially I was thinking of doing this series of "Poetic Sketches" in a single sketchbook. However, with all this work in different books, I am feeling scattered and I'm afraid I will never finish any of them! So, I am returning to working mostly in one book at a time, with the goal of finishing up this Fabriano Venezia book that I started last February. This sketch for The Sketchbook Project 2012 features Boulder Rock, with a view of Kaaterskill High Peak across the clove in the distance. I hiked there yesterday with my husband, but the weather turned and I didn't have a chance to paint the scene on location. Fortunately, I took a photo before the light got bad, and painted it from the picture. I used Golden Fluid Acrylics, and I do like the way they are working on this paper! 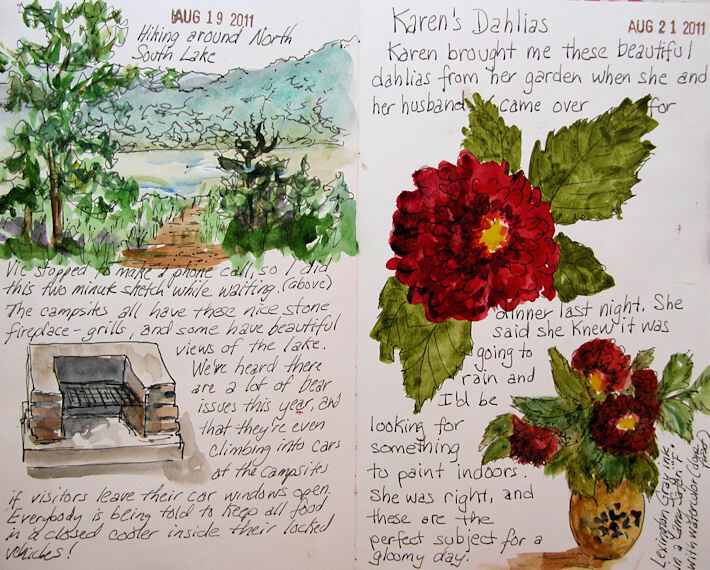 I only have two, two-page spreads left before this sketchbook is finished. I'm really happy to be able to share so many views of the beautiful Hudson River Valley and Catskill Mountains when the book goes on the world tour next year! Can you believe that I did it yet AGAIN, painting this sketch of Chatham Falls upside down in my sketchbook for The Sketchbook Project 2012? I can't! I tried acrylics in the book this time and was surprised at how easily the paint took to the paper, so I just might finish up the book with acrylics. The text in the lower right is a little hard to read against the dark paint. It says, "A day at Chatham Falls --- always time well spent. Painted on location with Golden Fluid Acrylics." I was at Story Farm, which is my favorite place in Catskill for fresh fruits and vegetables. They had the most gorgeous flower bouquets for sale that I ever saw! I couldn't resist. I brought these home and had a great time painting them out on my patio. There are beautiful birch trees around North South Lake, though many have been claimed by the beavers in the past couple of years! I sketched this clump of them the other day while resting in the picnic area. I used my Kuretake fountain brush pen for the first time, and oh my gosh, I love this thing to bits! I used the black cartridge that came with the pen, which is washable ink. I think I'd actually prefer an ink that stays put. 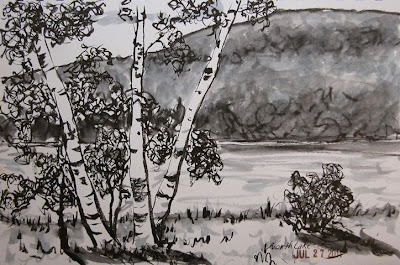 Along with it, I used a waterbrush filled with J. Herbin Gris Nuage to give me midtone greys, plus a waterbrush that I used to wash a bit of the black ink. Together they gave me quite a range. 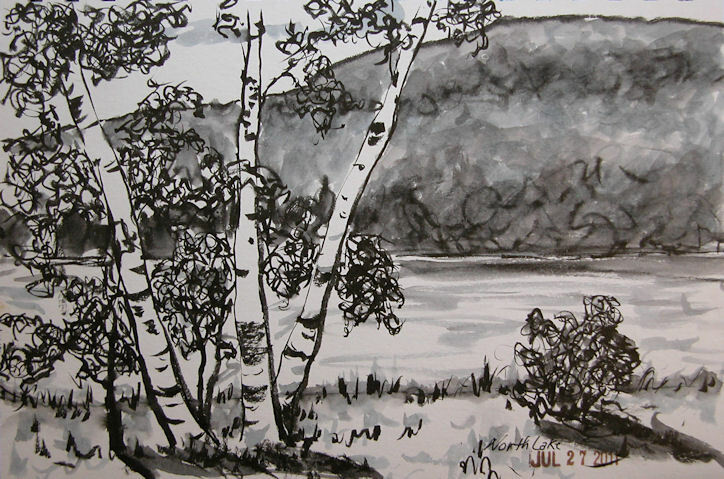 This was done in my Stillman & Birn Beta book, which is very rapidly becoming my favorite for pen and wash work. Before 1965, the Catskill Mountain House sat upon this rock ledge overlooking 60 miles of the Hudson River and the valley floor below, all the way to the Berkshire Mountains of Massachusetts. 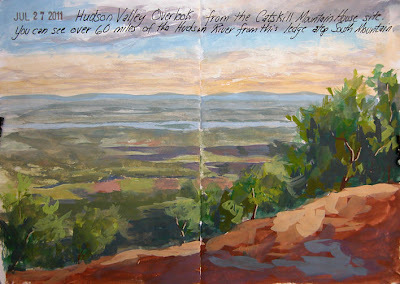 Visitors to the Mountain House would journey up the Hudson River by steamboat in the 1800s, and disembark in Catskill for the ride up to the mountains by horse-drawn carriage, and later by train. As modern transportation enabled vacationers to go further from the cities, the Catskill Mountain House fell into disrepair, and was taken down and burned by New York State in 1965, after they acquired the property. 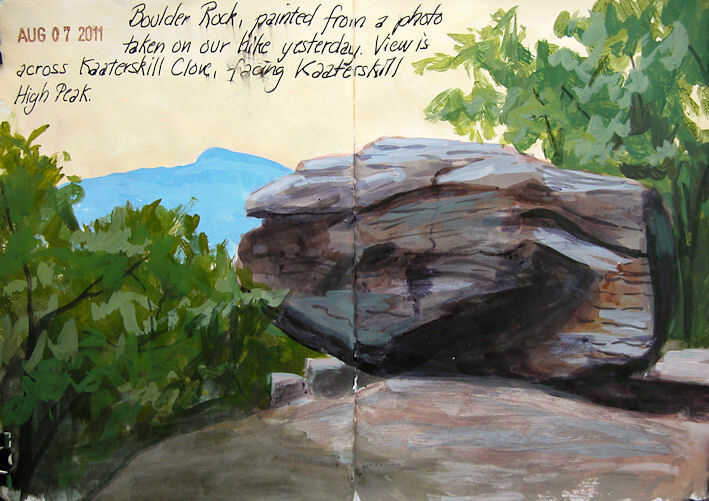 It remains one of the most dramatic views in the Hudson Valley, and I felt my sketchbook for The Sketchbook Project 2012 tour wouldn't be complete without it! It's brutally hot up on that ledge in the summer, but we had a relatively cool day and took advantage of the opportunity to paint there. This is one of my favorite spots in the world to paint. It's in Cold Spring-on-Hudson, New York. 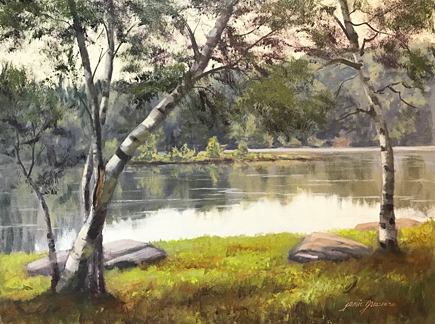 There is a point on the river facing north where you can see Storm King Mountain (left), Little Stony Point (center) and Breakneck Ridge (Right), and paint under the shade of the trees. 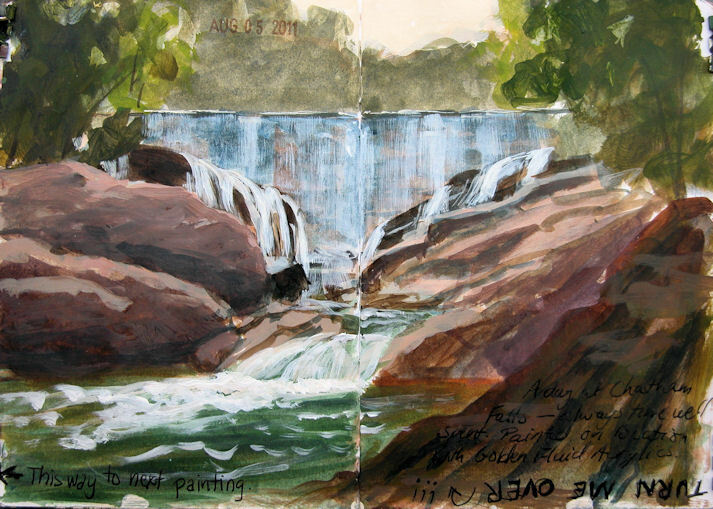 It was a brutally hot day when I was here painting with some friends, but a cool breeze off the river kept us comfortable. 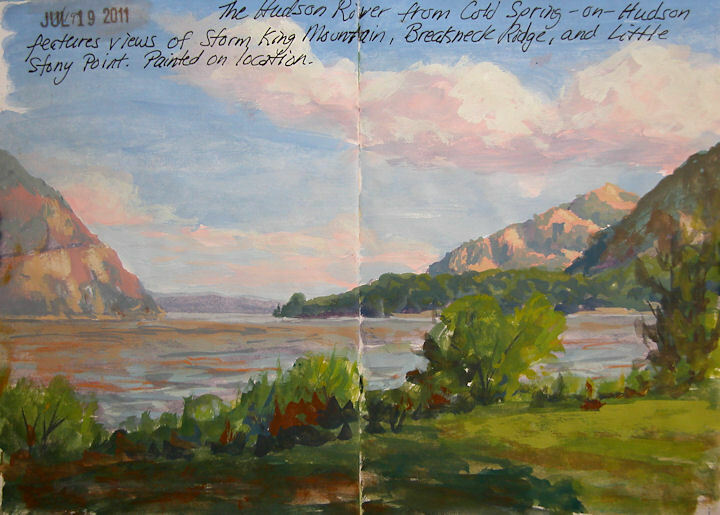 This is one of those famous Hudson River vistas that I really wanted to get into my sketchbook for The Sketchbook Project 2012, so that when the book goes on tour, others can enjoy the view as much as I do.